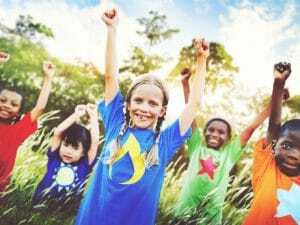 As the school year draws to a close, you are likely trying to figure out the best way to keep your children happy and healthy all summer long! Whether you need somewhere for your kids to go while you are at work or unique activities to keep them engaged, there are many benefits of sending your children to day camp. Below we discuss five of the top reasons to send your kids to camp this summer. One of the major benefits of enrolling your kid in a day camp is that it gives them the chance to step outside of their day-to-day routine and try new activities that they might not otherwise. Whether they are participating in a team sport like basketball or baseball, learning a new skill like gymnastics or surfing, or exploring their artistic side with a unique arts-and-crafts project, summer camp gives kids an opportunity to broaden their horizons and step out of their comfort zones. The average child spends 7.5 hours per day in front of a screen, and studies show that one in every five children is obese. The good news is that day camp provides a wonderful opportunity to get your kids off the couch and out into the world where they can explore nature, stay active, build friendships, and develop valuable socials skills and exercise habits that will last them a lifetime. Sending your children to summer camp is also an important part of their psychosocial development, according to Psychology Today. Filled with opportunities to take risks, challenge themselves, learn about new cultures, and broaden their horizons, summer camp is an important place for children to develop coping skills and resilience—lessons that will last them a lifetime. Summer camp is also the perfect setting for children to learn about the value of teamwork. As children are presented with opportunities to engage in group activities like planning the perfect theatrical production, winning a team relay race, or completing an obstacle course with the help of their peers, they learn the value of building relationships and working together for group success. This is another valuable life lesson that will prepare you child not only for a better school experience, but also for success in the adult world. Outdoor summer camps also provide kids with the chance to spend some quality time in nature! With rigorous school programs, after school activities, and hours spent watching TV and playing on iPads, it is rare for children to slow down and connect with nature. In the words of the American Camp Association, “the environment needs to be experienced to be appreciated.” We couldn’t agree more! The best way to understand the beauty of nature is to experience it first hand, whether that involves building a sandcastle with new friends, diving into the crisp, cool ocean water and learning to surf, or going on a nature exploration walk with fellow day campers. If you are looking for a day camp in the Los Angeles area, we encourage you to check out our Santa Monica beach camp serving families from Brentwood and Westwood with our convenient locations. Our camps are designed to provide children with hours of fun in nature while they learn valuable life skills and lessons that will last them a lifetime. Contact us today to learn more about our Santa Monica kids camp serving Los Angeles and its surrounding areas.